Monster Energy Honda Team rider Joan Barreda today rode to a sensational win in the first full stage of the Merzouga Rally with the team’s other riders also placing in top positions. Joan Barreda clinched the triumph in the second special stage for Monster Energy Honda Team after fellow team rider Kevin Benavides had taken the victory in the prologue yesterday. Barreda put in a high speed performance over the course of 200 kilometres on an error-free, yet highly demanding stage. The Merzouga Rally produced a few navigational traps which left some competitors in a quandary. Barreda is the new leader of the race. 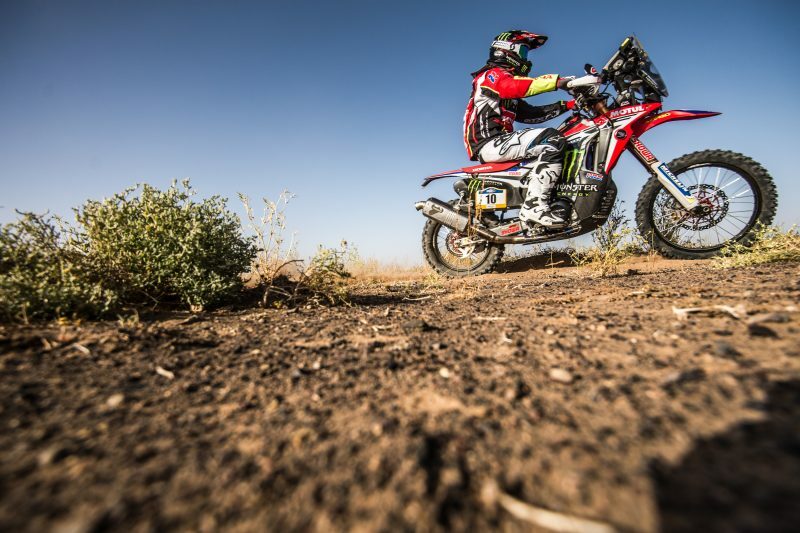 Barreda completed the special in 3 h 15’58”, some eight minutes ahead of the nearest second place rival. Ricky Brabec, Kevin Benavides and José Ignacio Cornejo likewise wrapped up the first stage with excellent results. Brabec posted third place and yesterday’s winner Benavides came home in fifth position. Paulo Gonçalves saw his ride hampered by navigational mishaps that caused him to finish further back. Tomorrow, Tuesday, the Portuguese rider, will be looking to claw back part of the time dropped today. The second stage, once again made up of two loops, will be held tomorrow with one part in the northern area of Merzouga and the other in the southern area of the Tombouctou Hotel. Navigation will again be one of the key factors of the day with a total of 175.30 kilometres to travel before the day is through. The first loop was very good, but in the second one we lost a lot of time. We will see what happens, because we had some problems with some of the notes that the organization had modified. In any case, there is still a long way left to go. After the third position in the prologue, I had a good starting position, but unfortunately I did not take advantage of it. I made a couple of navigation errors that made me quite late in qualifying today. With this difference, I do not know if I can do much, but I’ll have to keep pushing over the next four days, clocking up the kilometres and improving my navigation skills. The first stage was a complicated one with a lot of navigation and some traps which were difficult to get out of. We have managed to get a good result on this first day, but there is still a long way to go and we must keep working hard, stay focused on the navigation and at the same time, keep the pace on track. Stage one is over. It was a pretty fast one with a lot of fesh fesh. Starting on loop A was okay, but when we got onto the second loop it was very tough. The side by side vehicles were still on the loop and had made it really, really dusty. We managed to make it through to the end of the special. We are going to push tomorrow and over the next four days. This was the first stage of navigation and it was an entertaining one. You had to be very attentive to the roadbook and fast too. The first loop went quite well and I didn’t make any mistakes. In the second, we came across the UTVs and there was a lot of dust and it got quite dangerous. I had to slow down. I had a minor fall, but it was nothing. Let’s see what’s tomorrow has in store.